Legacy services such as X.25 are still in use worldwide for a range of applications. Over the years, many customers have made significant investments in equipment and processes that depend on X.25 and specific features the service offers, making it difficult or disruptive for them to move to alternative services. Meanwhile, operators cannot guarantee the quality of service or SLAs over networks based on ageing or unsupported equipment. Ideally, they would like to retire the legacy networks completely, migrating all customers to an IP service, with lowest overall cost. However, service providers are wary of forcing customer into a potentially costly and disruptive upgrade that is likely to result in a loss of customers and revenues. Without an alternative, some carriers have been running X.25 unsupported, with well-publicised network outages as a consequence. 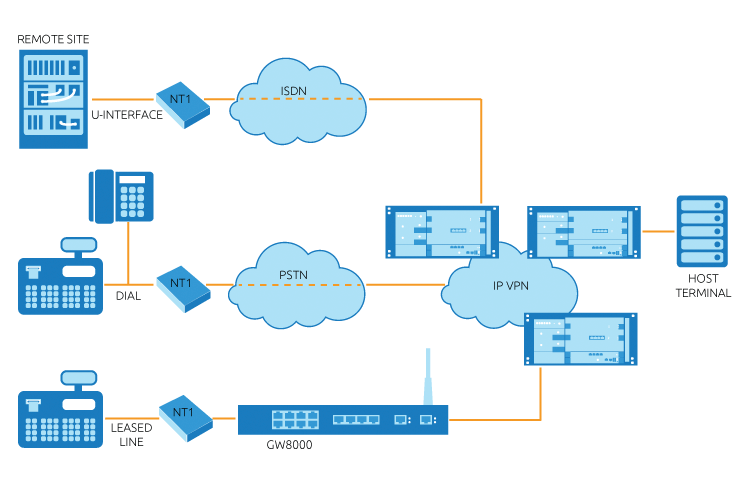 Virtual Access offers a solution where all X.25 services and access possibilities can be replicated on a modern IP network with fully supported equipment. Disruption of customers’ services is minimised and equipment replacement eliminated, while additional methods allow combined services to be offered, as well as a simple migration path to All-IP when the customer is ready. Unlike other solutions, Virtual Access offers complete replication of all X.25 advanced features, not just transport. The solution is built from three main components: the AOS; the Virtual Access Gateway, and Activator, Virtual Access’ automated deployment, provisioning and centralised management platform. The AOS connects to the IP network and directly replaces existing public X.25 networks supporting both traditional leased line, ISDN, dial and IP access. The AOS can act either as an X.25 POP, directly terminating leased lines to the customer site, or as an X.25 server located somewhere in an IP network. In the latter case, a Virtual Access router is used on the customer site to transport X.25 connections over broadband IP access. The AOS is responsible for providing switching and all the features of the X.25 network that the customers may be using.